Style: Continuity, connectivity, form and flow. A teak-panelled entrance way leads though to a huge space with high vaulted ceiling and giant panels of glass overlooking the ocean. Surely this is lobby of a very grand resort. Well the lobby of Alia Villas Soori is impressive but this isn't it. This is the entrance to a very private paradise - over 5,250 square metres of pure indulgence. Welcome to the Ten Bedroom Residence at Alila Villas Soori, surely Bali's most impressive private resort villa. The space is spectacular. Take the pool for example, it is the size of your average resort pool but normally you have to share, heaven forbid. And it is difficult not to let a little megalomania creep in once you've felt (all be it temporarily) like the owner of all you survey; "Its mine, all mine", says my husband in arch-villain tones as he sees the yawning blue expanse of water. Then there is the dining and lounge area with its two-storey vaulted ceilings and wrap-around glass. When you dine here on a modern version of a baronial table asking someone to 'pass the salt' from one end of the other is no small request - that's a long way to go. Luckily there is a butler for that sort of thing. In fact, should you require it there is 24/7 service from a dedicated team of up to eight butlers not to mention private chefs and chauffeurs. Now to be frank TLTB is used to a little luxe (we're spoilt, we admit it) but this, well, this is a whole lotta luxe. This isn't just luxury, this is ultra-luxury there are no other words for it - the ultimate villa in an already stunning resort. The villa is really a series on interlocking pavilions. Our room alone is the size of your average New York apartment. We're in one of the two master bedrooms on the upper level, each with oversized Jacuzzi (nothing is done by halves here, indoor and outdoor shower and a massive walk-in closet just begging for designer-labels. Up early the next morning I wander out onto the terrace. From here I have a view right down the black sand beach, the spray from the crashing waves rises into the air in a fine mist and a lone fishing boat bobs on the blue. I wander through landscaped gardens interwoven with cube-like pavilions, then inside to browse my private library and inspect my gourmet kitchen before I am drawn inevitably back out to that infinity pool and the ocean beyond. This isn't just luxury, this is ultra-luxury there are no other words for it - the ultimate villa in an already stunning resort. Six bedrooms at ground level open out to Jacuzzi and private pools. Here too bathrooms have oversized bathtubs, grand shower rooms and long double vanities. Every bedroom comes fitted with all the techno toys: 40-inch LCD TV, Apple TV and Bose hi-fi system. This is the perfect place for an idyllic escape with friends and all ten bedrooms have uninterrupted views of the peninsula and the Indian Ocean. It is as if we are on a luxury island floating between the wild waves and the sea of iridescent green rice paddies. The dark volcanic stone of the resort reflects the black sand beach, the grey slate the smooth trunks of the banyan tree. Everywhere are driftwood sculptures and the colours of nature. Throughout the property the view is framed by the buildings like a painting in a gallery, drawing your eye out to the horizon. As befits an Alila property it is also gloriously 'green' with a lot of attention paid to environment issues and sustainability. The resort is a labour of love, it is designed by the much-awarded SCDA Architects ,Singapore (SCDA also designed Alila Villas Hadahaa, Maldives). The man behind SCDA is Chan Soo Khian and Alila Villas Soori is his baby in more ways than one because he owns the land the resort is built on. In every stylish stone you'll see the passion of Soo Khian. When he first bought the six-hectare plot on Bali's Wild West coast his initial intention was to build himself a private villa but he wasn't the only one attracted by the area's pristine beauty. Soon the combination of the natural environment and the design genius of Soo Khian attracted attention and encouraged by his friends his idea for private home became a 44+ villa resort, with the ten-bedroom residence as its crowning glory. Tucked away in this quiet corner the ultra-opulent villa has become something of a haven for Asia's elite and more than one Hollywood star has stayed here. Knowing this I assume what I hope is an Oscar-worthy pose by the pool, but clearly there is much work to be done. Luckily the villa has its own private gym and double spa treatment room (would we expect anything less?) where shy billionaires can be massaged and manicured in complete privacy. Maybe a day or two in the gym will transform me into a screen goddess. Predictably I settle for a two and a half hour Beauty and Balance treatment in the spa instead. It as been raining while I've had my massage, droplets of water as large as Liz Taylor's diamonds shimmer on the frangipani leaves and the sky is a soft grey, all is calm and quiet. We're a world away from the chaos and crowds of Kuta. This is 'authentic' Bali, where entire villages still dedicate themselves to cultivating rice or sculpting stone rather than tourism. A short walk down the beach Ibu Novi still harvests salt from the sea as her family has for generations. Here on the quiet west coast it is easy to let the spirit of Bali seep into your soul. 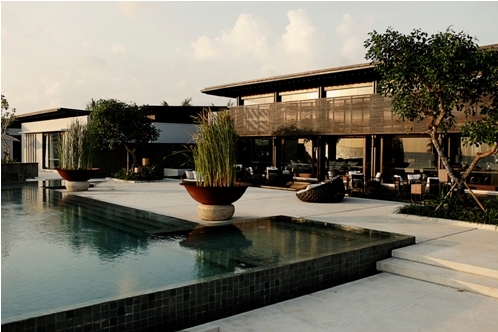 Alila Villa's Soori has designed a series of 'journeys' to tempt you from your villa paradise. You can a ride on a segway through local villages, visit an artist or tour the temples. We take an early morning culinary tour to the market with the chef and choose green leafy vegetables and silvery fish for our Balinese cooking lesson. We pound the spices and mix the sauces and then we sit down to eat the result of our labours in the open air Coast restaurant with a view of the beach. Opor Ayam chicken in spicy coconut tingles our tongues as we watch the waves - Alila Villas Soori has given us a true taste of Bali in more ways than one. Insider Secrets: You have to pick you moment to book the ten-bed residence because the owner stays frequently - and why wouldn't he? Junior Luxies: Children are catered for with adoring staff and a variety of magic journeys created just for them. Choose from excursions with names like: journey of the Little Soori Chef, Journey of the Young Artisan, Let's Go Fly a Kite and, our favourite, Journey of Beautiful Butterflies.